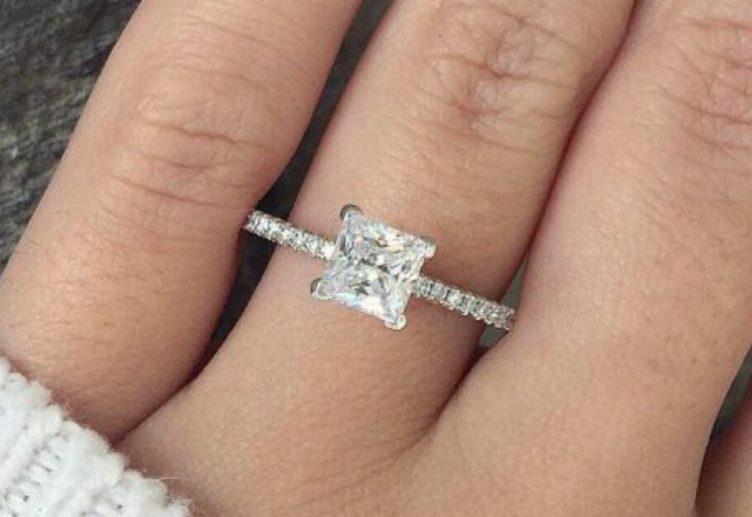 Affordable Princess Cut Engagement Rings: Our Favorite Selection! As women, and maybe even some of you men out there, most of us love ring shopping, right? From the sparkle to the diversity. The uniqueness of the classic and timeless. There are so many gorgeous options. So what kind of style do you like the best? There are different shapes of diamonds, different colors, different types, and of course the number of diamonds on the ring. Do you like things simple? Do you like a ring covered in sparkle and shine? Do you find yourself attracted to more gold or silver? You may be ring shopping obsessed with Pinterest boards and internet searches full of dazzle. 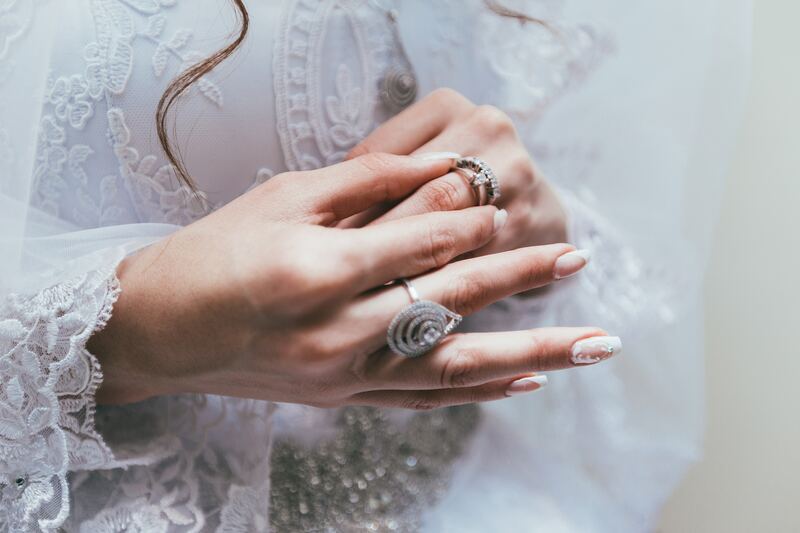 But when it comes down to the time to really decide which engagement ring is right for you or your significant other, the task can seem a bit daunting. This ring is going to be on her finger for the rest of her life, so you want to make sure you find one that is perfect for her personality, style and flatters her hand. How can you possibly choose? 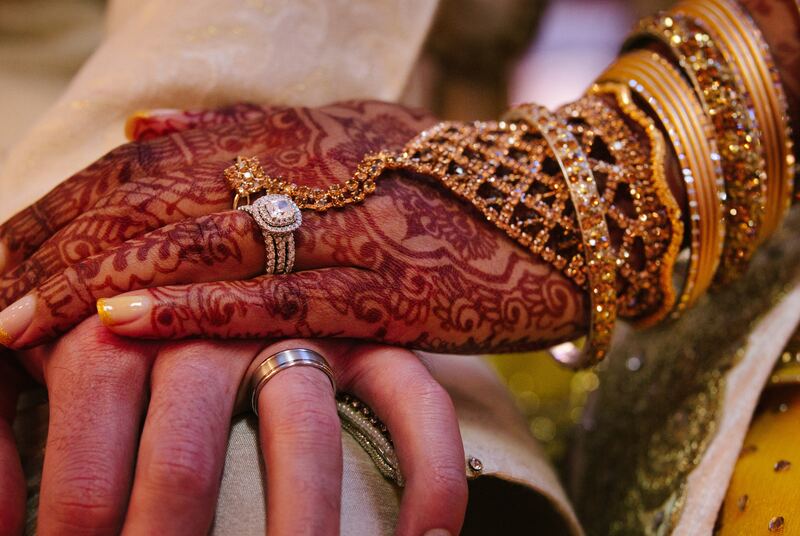 We love so many of the stunning engagement rings you will see out there these days. We are going to narrow in on a specific category of engagement rings and that is those with a princess cut diamond or other gemstones. What is a princess cut? You may be thinking of some kind of crown or tiara when we say princess, but a princess cut diamond is actually a very simple shape. The princess cut means that the face of the gem that is facing upwards is flat and rectangular or square shaped. Then, from a side perspective, the gemstone is pointed down in an upside-down pyramid type shape. This specific type of cut is the second most popular of any type of cut, right behind the classic round brilliant shape. This cut is timeless and has been seen and used for decades! It is such a simple and elegant way to present a diamond or gemstone. Because of that, this is a gorgeous and very popular option for any ring, but especially an engagement ring. It doesn’t matter if you are young and wearing this ring for the first time after your significant other has asked for your hand in marriage, or if you have been wearing it for sixty years. It is a stunning shape and will never go out of style. 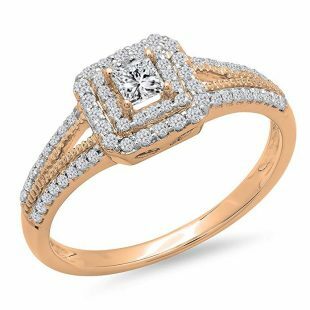 We want you to see an array of some fabulous options of the princess cut engagement rings so that you can pick which one is best for you, your style preference, and your budget. 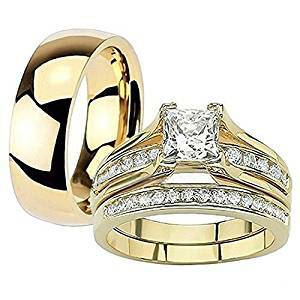 First, we have a gorgeous gold ion-plated ring that comes in a set with a men’s ring as well. You get the whole set at a fabulous price. The women’s ring is a full wedding set, with the engagement ring and the wedding band separate. The ring is made of stainless steel 14k gold plated. That means that the metal material is stainless steel, giving you the price tag that you may be looking for while being plated with 14k gold that makes it the gorgeous color you want. 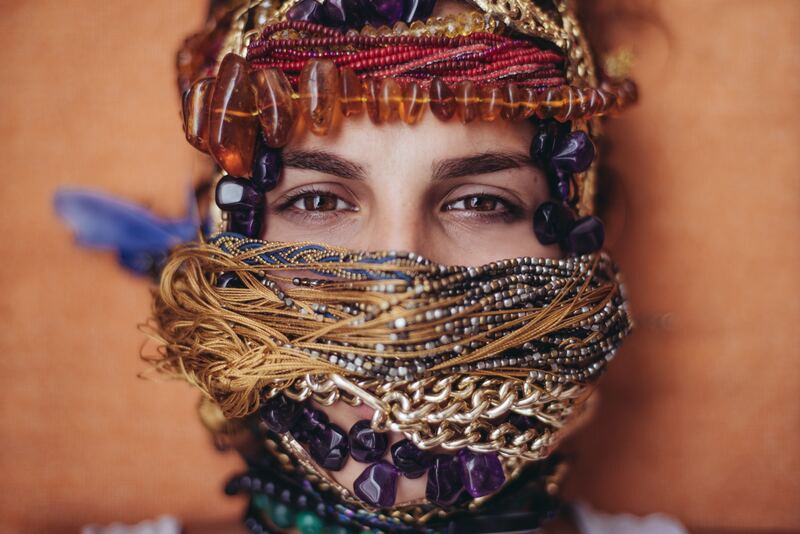 One thing we love about stainless steel jewelry is that it is strong and durable. It will not tarnish or discolor over time, which for an engagement ring that is definitely something to take into consideration. The ring comes in sizes ranging from 5 to 11. 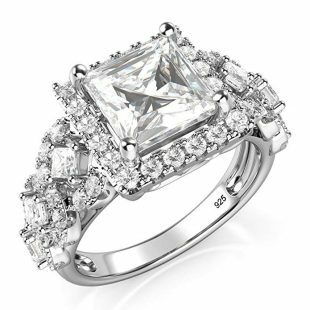 This gorgeous piece displays a stunning 1.25-carat princess cut stone in the center. We love the way this cubic zirconia gemstone is presented, as it is an incredibly beautiful focal point to the entire set. The sides along the ring are lines with twelve small, 1 millimeter each, round cubic zirconia stones. This adds the perfect amount of sparkle to the ring and in our opinion, these small stones highlight the princess cut wonderfully. The entire set up of the ring is to emphasize that princess cut stone in the middle. We love this ring! It is a great option if you are looking for something that is gorgeous and flashy, while still being budget-friendly. Switching gears here in almost every way from the last ring, we have this phenomenal engagement ring that will leave your jaw on the floor. We are willing to bet that when you see this gorgeous piece the first thing that will catch your eye is that giant diamond in the center. This is a 1.10-carat princess cut diamond. 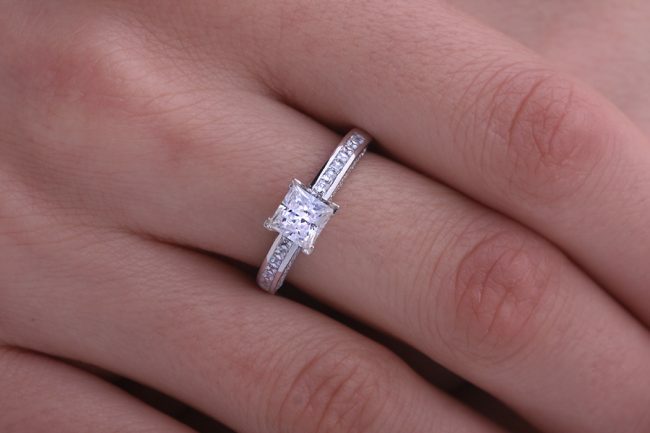 It embodies everything that we love about the princess cut. It is elegant, classy, and bold. The band is 14k white gold. The band is offered in rose gold, white gold, and yellow gold. What does it mean to be white gold? We are all familiar with yellow gold, as it is gold in its true color. 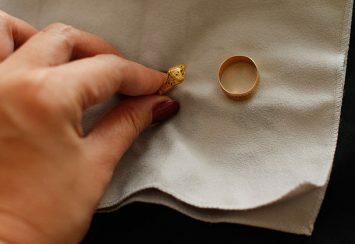 Pure gold is measured at 24 karats, but when it is in its purest stage like that it is too soft to create jewelry. With that being said, the pure gold is taken and an alloy of some sort, oftentimes silver, nickel, or copper, are added to the pure gold to make it stronger to work with and hold its shape and durability. That is why here, you see 14k. That simply means that the ring is made up of 58% pure gold and 42% of an alloy. In order to make the ring white gold instead of yellow gold, the pure gold is mixed with a silver-colored alloy such as nickel or platinum. The piec e is not inexpensive or cheap, but it is absolutely quality that you are paying for. This engagement ring is durable, it will last you your engagement, marriage, and lifetime. It is a lavish piece and sure to make your loved one feel like the queen she is. As we stated before, the large diamond in the middle is 1.10 carats and is a sharp princess cut. The diamonds along the sides of the larger diamond, making the band shine, are each round stones and sure to compliment the princess cut diamond beautifully. This ring is offered in sizes 3 to 11 and even has some half sizes and quarter sizes, like the 7.25. But what if they don’t have your size? Don’t worry! You can get the ring sized to ensure that it fits you if you are looking to tell your man exactly what you want or to fit your bride-to-be if you are here looking for that perfect piece for her. There aren’t enough words out there to describe how beautiful this piece of jewelry is, in every color! What are you waiting for? This is a gorgeous princess cut option and there’s a good chance that your lucky lady will be just as obsessed with it as we are! 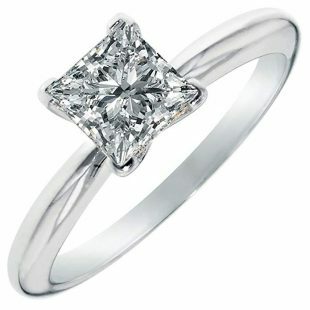 Are you looking for a princess cut engagement ring that is simple? There is definitely a special kind of beauty in simplicity. This ring is all about featuring that princess cut stone that you have been dreaming of. It is made of solid 14k white gold and is a well-priced designer piece. The stone is a cubic zirconia diamond that keeps that price where you want it, while also offering the quality that you are looking for. It comes in sizes 3.5-11. We don’t often see rings that are made available to order in such small sizes, so we love that it has an abundance of sizing options to ensure that you will be able to get one that is perfect for you or your significant other. In order to make sure that you can keep the sparkle that you love so much about it, simply make sure to clean it. That can be as easy as taking warm water with a little bit of mild soap to dip it and softly wipe it clean every now and then if you see the sparkle start to fade. This engagement piece is a gorgeous and simple piece that is sure to invite smiles and compliments. 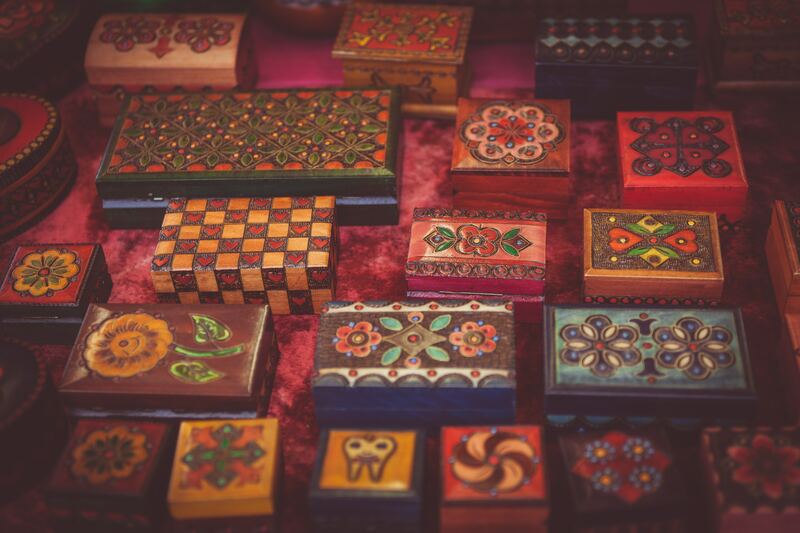 Are you a traditional type of woman? You like a simple and clean look. If that’s not you, are you the type of woman who likes to be unique? Do you like to stand out in a crowd? Or are you that special one who likes things right in the middle? You like a good classic piece of jewelry, but nothing beats a personal touch or a little pizazz to your jewelry collection. If that fits you, or the woman that you are looking to buy a ring for, this one just might be fitting for you! This piece is full of detail and it is breathtaking to look at the layout altogether. The contrast of the colors, the shapes, and sizes of stones make it such an incredible engagement ring and one that will make your woman very happy! It comes at a price that is very budget friendly. It is made of .925 sterling silver with a rhodium finish. This additional finish to the sterling silver makes it so that it will not tarnish on you. It also adds a brilliant bright colored finish that makes it appear more similar to white gold. These qualities make it a great low-cost alternative for a more expensive piece that may look similar or just like this ring. What makes it so special? The details are everything. First of all, kind of like addressing the elephant in the room, we have the large stone right in the middle. How charismatic is that? This stone is London Blue Topaz with a midnight blue hue. Have you heard of London Blue Topaz? Essentially it is one of the specific types of topaz within the topaz family. 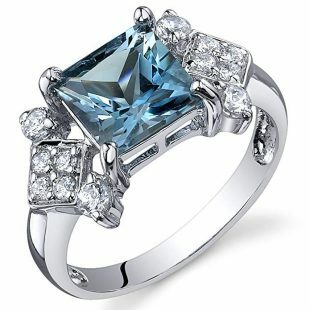 The London Blue Topaz is often regarded as one of the highest quality types of topaz out there. 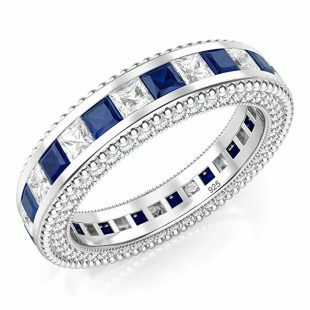 This princess cut blue stone is sure to catch eyes with its fantastic color and shine! Next, we have the diamond shape design on either side of the diamond that is filled with four round small diamonds. This contrast in color, shape, and size is very flattering to the gemstone in the center. On the upper and lower sides of the diamond edges, there are additional round stones that keep this ring perfectly symmetrical. The piece is available in sizes 5 to 9. 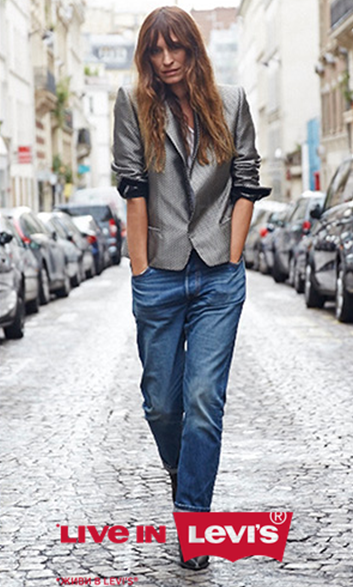 If you are looking for individuality and timelessness, we think this is a match made in heaven! Ah, the classic piece. This piece is timeless and has been a go-to style for decades. It is the kind of ring that will remind you of your grandma, but in a very good way! A piece that you will want to pass down to your posterity. This engagement piece is fabulous. The variation, yet simplicity, is so special. It is made of 14k solid yellow-gold or white-gold. It has a 1.5-carat cubic zirconia princess cut stone in the center and is met by two more of the princess cut smaller cubic zirconia gemstones. Each of the three princess cut gemstones is featured on four prong stands which is common to display the full depth of the cut. It is beautiful from top to bottom. Furthermore, the display of the three princess cut stones is expanded by 5 small round stones on either side that is embedded into the band. 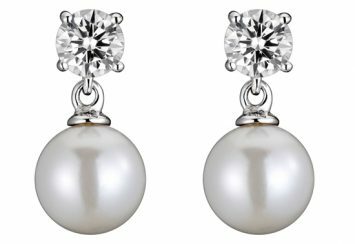 The cubic zirconia stones are of great quality and are a fabulous option if you are looking for a less expensive option than that of a real diamond. We love the way that this setup gives life to each of the stones and is full of sparkle! The ring is available in sizes 4 to 9 and is the type of piece that you will not be able to take your eye off of. This piece is one that you may not be used to seeing. It is a gorgeous band ring that is full of detail and charm. The entire band displays alternating colored stones. Each of the gemstones is cubic zirconia. The piece is solid sterling silver that is stamped to prove authenticity. It is rhodium plated to prevent tarnishing and ensure the shine that you are looking for in a piece. It is available in sizes 4-12 which allow for less stress about a ring fitting you right whether you need a small or larger size. The size variation also makes it a great option if you are each looking for an option, as this piece is totally gender neutral. We love how it allows you to make it unique to you. You may want to stick to this more simple piece, as you don’t have to worry about a larger stone that could get in the way, or that may just not fit your style. Or if you are the type of girl who likes the idea of having a couple of rings stacked together, you could always buy a more standard piece. We love the idea of pairing this piece with a larger blue gemstone piece. Regardless of what you choose to do or not to do, this is a great option for princess cut pieces. It is an inexpensive piece and is full of character and shine! Before you panic at the size and sparkle of this thing, knowing that the price tag is probably just as large, we recommend staying put. You will be so surprised at the price of this quality product, as it looks like it would cost a fortune. But rest assured, it will not cost you a kidney on your special proposal day. This gorgeous piece is made of 14k yellow-gold or white-gold. It is a fantastic choice. 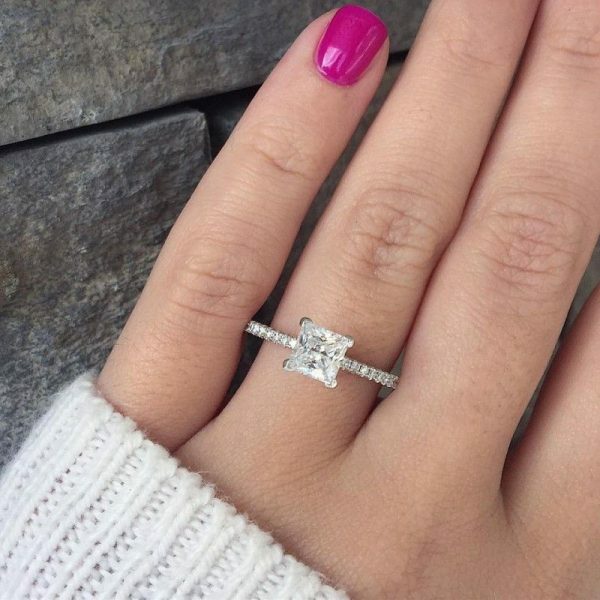 Everything about it is unique, even the popular princess cut stones. Each of the stones is a real diamond, showing your special someone just how much she means to you. Because of the quality of the product, we truly think this is a steal of a deal! The center is a large square shape, the borders of the square matching the embedded small circular diamonds all throughout the band. Each of these small circular diamonds gives light to it that will make it shine and make your ‘significant other’ feel like a celebrity with the number of compliments she will be getting each day that she wears this fantastic piece. 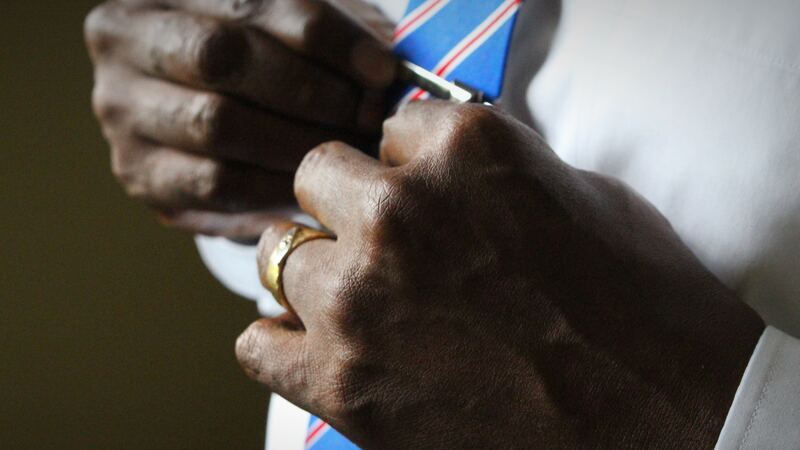 Saving the best part of this ring, in our opinion, for last, let’s talk about the center. As beautiful as the dozens of small round diamonds are throughout the ring, it all feels like a way to really contrast and make the square-shaped diamonds in the middle really stand out. And when it comes to a princess cut diamond, you shouldn’t expect anything different. They are all about standing out and sparkling gorgeously alone or surrounded by other diamonds! A very special quality of this specific princess cut diamond is that it is actually four small princess cut diamonds. They are placed artistically close together, appearing larger as a group and still holding true to their quality and shine. This is a ring that she will not be able to stop staring at, and one that friends and family will be congratulating you on finding for her. It is absolutely gorgeous! In the beginning, we said that you may think of a crown when you hear the words “princess cut diamond”, but that that is not actually what a princess cut is at all. We still stand by that, as a princess cut means that the stone is a rectangular or square shape. However, the combination and layout of this specific ring may just bring that crown idea back into your mind. We can picture a larger version of this exact ring making a gorgeous crown to wear on the head. With that kind of visual at first glance, how could you possibly pass this princess cut engagement piece up for your special someone? It is sure to make her feel like a queen. And we’ll tell you instead of her that the price will make you feel like a kind, as it is priced shockingly low for the quality and detail that is involved with it. It is full of life with its different shapes and stones, but especially that bright and shiny large princess cut cubic zirconia gemstone right in the middle. But that’s just the beginning of this glamorous sterling silver piece. Let’s not forget to mention that it has a rhodium plate finish that will ensure its longevity and ability to hold its shine without tarnishing. 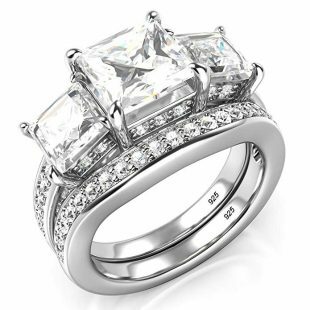 The large center princess cut stone is outlined by dainty circular cubic zirconia gemstones from corner to corner. Then there is the band which is fantastically flashy. It included more small round gemstones with a couple of diamond shaped stones on each side. If you are looking for a flashy engagement ring for a price that is a lot less showy, this is one for you! It’s a great piece and we love how each piece comes together to form something so beautiful and unique. This piece is one of those that shout, “less is more!” We are thrilled with its quality and beauty, especially for the price it is available for. And we are not the only ones who are loving it! This sterling silver piece is rhodium plated, giving it all the shine that you might see in a white-gold product. 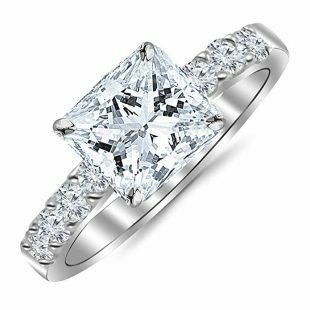 The center princess cut cubic zirconia gemstone is placed in a 4-prong set that literally makes it stand out from the rest of the piece. This focal point is simple and so pretty! As we carry on that trend throughout the rest of the ring, we see a band lined with small circular shaped cubic zirconias. We love the way that this gives that added pizzazz to the ring while holding true to its character of beauty and modesty. This ring only has limited sizes, ranging from 6.5 to a size 10, but not all sizes in that range are available. So if you are considering purchasing it, we recommend that you don’t hesitate any longer! This high-quality piece is full of integrity and sparkle. We love how simple, yet luxurious it is. It’s the perfect middle ground for those women who don’t want something too showy but want an engagement ring that stands out as such. To finish up this gorgeous collection of pieces, we end with one of the most sparkling and fabulous rings we have yet to see. This is a quality piece that is priced fair. It comes in three colors, including rose gold, white gold, and yellow gold. It is available in sizes 4 to 10 and can be resized to ensure that it is money well spent and a piece that you can keep forever without having to worry about it falling off. The diamonds in this ring are real and are each stunning in and of themselves, making a combination that is jaw dropping! 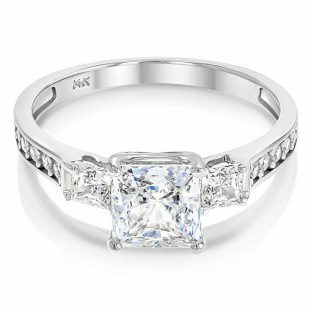 This halo style piece is all centered around the perfectly sized princess cut diamond. The halo effect comes into play as the princess cut diamond is outlined with smaller circular diamonds. They surround this center stone not once, but twice. The contrast in diamond shapes and sizes catches your eye immediately with this piece. We love the way that the entire halo part of this ring is displayed on a prong setting that makes it stand out just right. Though it is definitely flashy and full of sparkle, the entire diamond count is right around 0.50 carats. So overall it is more on the dainty side and you don’t have to worry about it looking gaudy or overdone. This beautiful piece comes in a red jewelry box that is sure to make her heart flutter as you pull it out of your pocket and get down on one knee! We are obsessed with this ring and how lovely each of its special qualities is. That’s a wrap. So there you have it, a plethora of gorgeous options with fabulous princess cut gemstones. We hope this gave you a better idea of ‘princess cut’ means and ways that the princess cut stone can be incorporated into a ring, regardless of your budget or style. 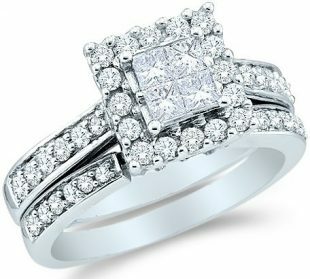 An engagement piece looks beautiful with different colors of princess cut stones and different sizes as well. If the princess cut is your preference, maybe it wasn’t before but it is now or maybe you have always been obsessed with this design, then you can’t go wrong with any of these options. We are enamored with each of these pieces. So from here, we’ll leave you with encouragement to enjoy every step of the ring shopping journey and well wishes to your forever future. Good luck!